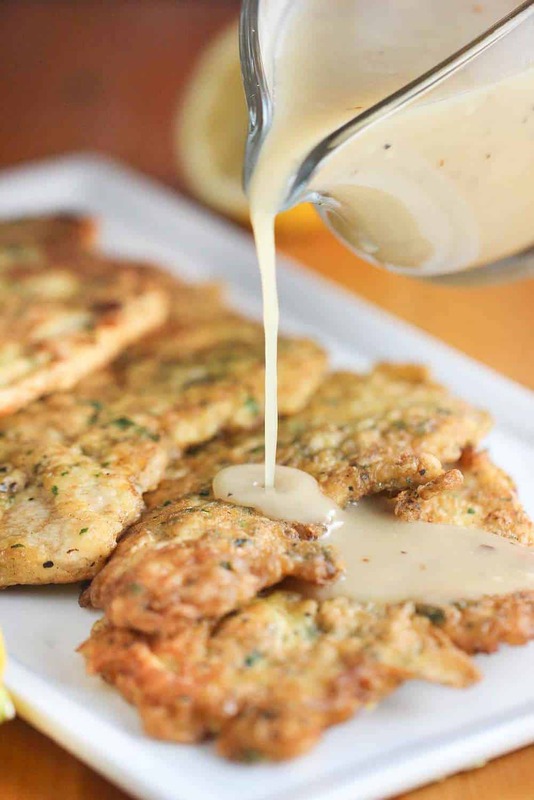 This Chicken Francese recipe is an absolute favorite of ours. It’s so flavorful and bursting with flavor. Oh, it’s doesn’t get much better than this dish! Delicious and beautiful, all at the same time! Watch us show you how easy it is to make this incredibly delicious dish. It’s so good and a lot of fun to make! The ingredients in this dish are simple and work beautifully together. The simplicity of this dish is really what makes it shine. White wine and lemon and egg…doesn’t get much better than that! 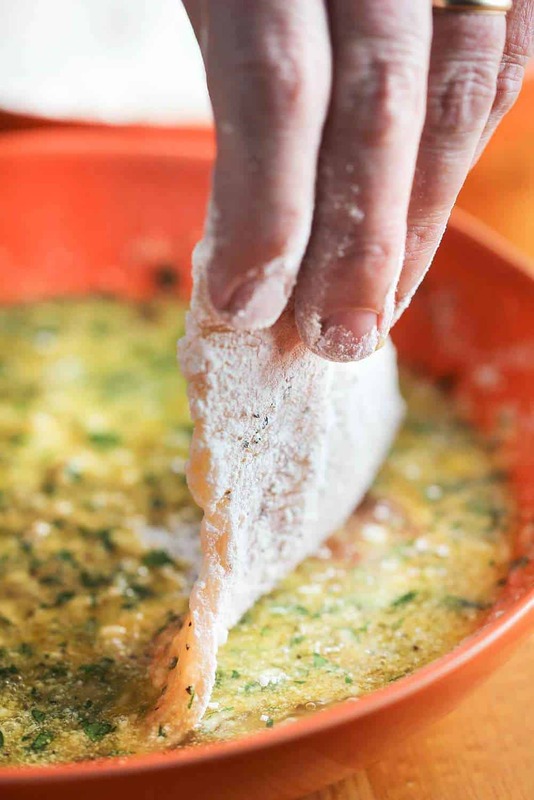 You dredge in seasoned flour first, and then egg with herbs. Make sure the chicken cutlets are nice and thin. You can easily place them in a large freezer bag and pound them until they are about an 1/8″ thick. Then cook them in the olive oil until beautifully browned. You can keep them warm in a low-temp oven. Resist the urge to put the breaded cutlets in the sauce, this often causes the egg ‘breading’ to fall away from the chicken cutlet. And then the sauce. Oh, that sauce. White wine, chicken stock, garlic…and some butter. IS IT CHICKEN FRANCESE, OR CHICKEN FRANCAISE? This dish has French and Italian origins, but it is most commonly seen in Italian eateries. Learn more about the history of this amazing dish here. The presentation is just beautiful, too. 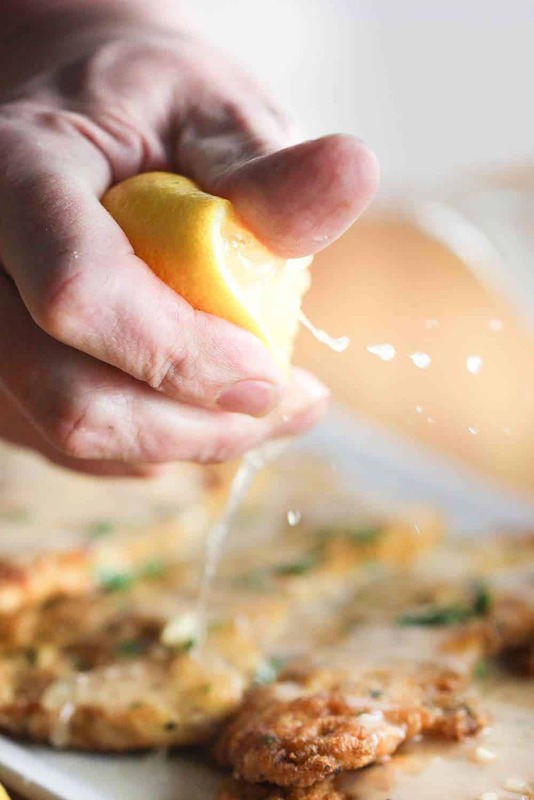 Finish it with a squeeze of fresh lemon, and your guests will be so impressed! 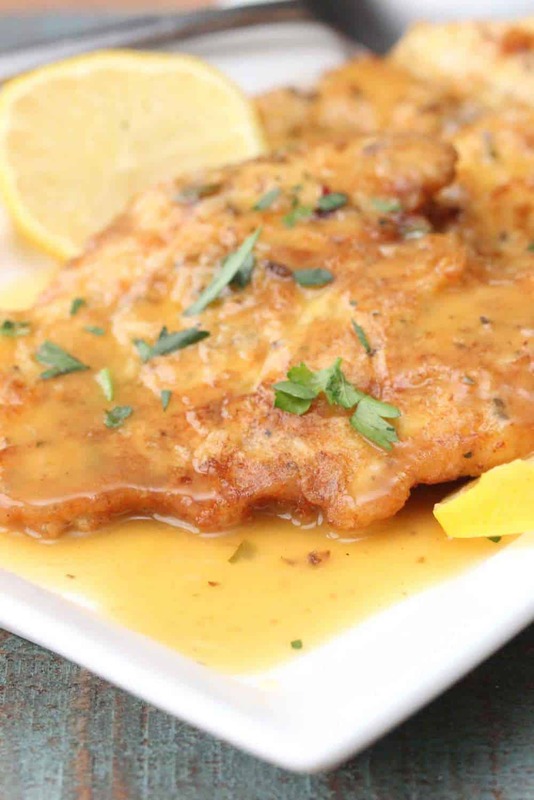 If you enjoy this amazing Chicken Francese, chances are you’d also love our Pork Milanese! And this amazing dish can literally come together in 30 minutes. Perfect for a weeknight meal. But impressive enough to serve to guests on a special dinner party. Serve with salad and crusty Italian bread. Just amazing. 100% Loon Approved! 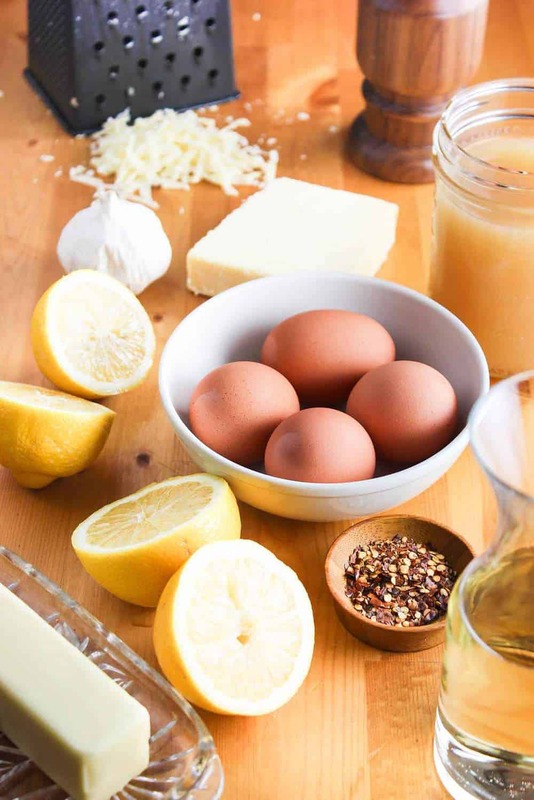 Now, it’s time to make this incredible Chicken Francese Recipe! This Chicken Francese recipe is so easy to make, and one of the tastiest dishes there is. The 'egg on the outside' gives it a wonderful texture. And the sauce is divine. Amazing. 1 cup flour for dredging (you'll also need 2 tablespoon of the flour mixture later for the sauce...but we'll get to that later in the instructions). Place the chicken (one at a time) in a large freezer bag, and using the side of a meat tenderizer, pound the chicken to 1/8" to 1/4" in thickness. Cut each pounded chicken piece into halves, or thirds. Set aside. Pour the flour onto a platter or plate. Add 1/2 teaspoon of salt, 1/2 teaspoon of pepper and the 1 teaspoon of garlic powder. Gently mix together with a fork. Remove 2 tablespoons to use later for the sauce. In a second small/medium-sized bowl, mix together the eggs, Parmesan, 2 tablespoons of the parsley, and a pinch of salt and pepper. 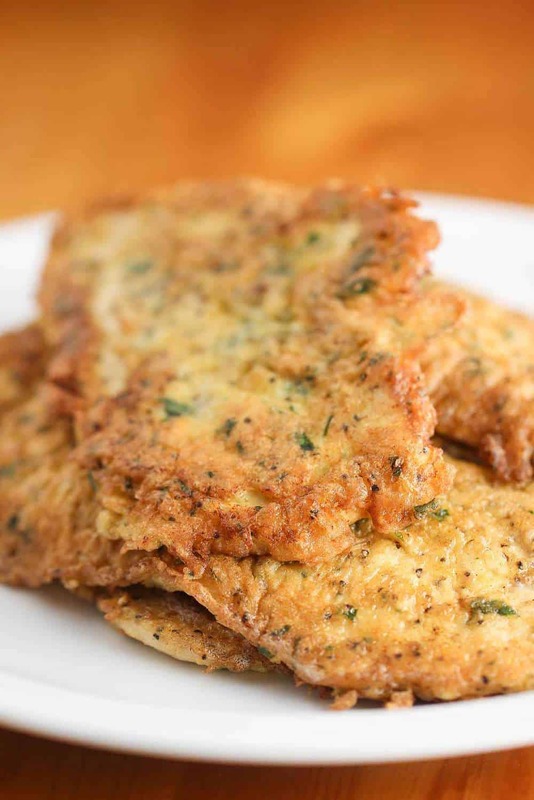 Dredge each chicken cutlet in the flour mixture and then dip into egg mixture, fully coating. Heat oil over medium heat in a large skillet. After the oil has heated, add 2 tablespoons of the butter. Place the coated chicken into the hot skillet, 2 at a time. Cook for 3 to 4 minutes, until nicely browned on the bottom. Flip and cook the other side until completely cooked through and nicely browned, about another 3 - 4 minutes. Remove from the pan and repeat with remaining chicken. (Cooked cutlets can be made 1 to 2 hours ahead of time. Re-heat in (350 F) oven 15 minutes before serving, or keep warm in oven (220 F) until ready to use. In the same skillet, add the remaining 2 tablespoons of oil over medium heat. Add garlic and crushed red pepper, cook until soft, about 3 minutes. Add the reserved 2 tablespoons of seasoned flour, and mix completely. Add another tablespoon of flour if too wet, should resemble wet sand. Stir and let cook for about 1 to 2 minutes (don't let it get dark brown). Add white wine and chicken stock and bring to a boil. Reduce the heat. Add the lemon juice. Stir until slightly thickened. Season with a healthy pinch of salt and pepper. Remove the pan from the heat and stir in remaining 2 tablespoons of butter. Stir until melted. Taste and adjust seasonings, if necessary. Place cutlets on plates, or platter, and pour sauce over the top. I Love to cook – it’s a stress relief for me, and this recipe was so delicious! I served it with a kale salad (Greek style with feta and lemon Dijon vinaigrette) and my husband said he’d eat this meal again in a heartbeat…EVEN with the kale salad along with it Amazing the difference with the egg wash on the outside of the flour dredge…A+ Thank you! Just wanted to thank you for sharing this wonderful recipe,I made the first time for my Italian friends, they said it was the best they ever had,I’m making it tonight for my husband, he loved it the first time. I can’t wait to make it aging for my next dinner party. Just made this for dinner and it is such a delicious and light dish! I felt compelled to come back and write about! Even my 5y old was pleased. 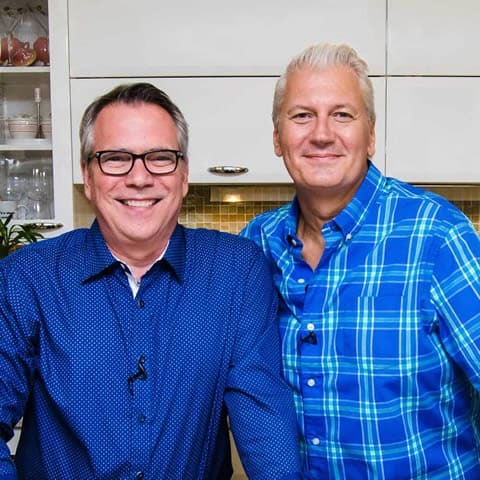 Thank you and keep up those great recipes coming. I will be checking in daily for inspirations and ideas! This is a delicious recipe! Will be making this for Valentines Day! Could I use anything other than the wine? Kris, thank you for this chicken francese recipe. Looking for easy, chicken recipes brought me here. It is the very best I have ever tired. It is quite rare that my wife have seconds when it comes to food. She watches how much she eats. Well, I was surprised when she had seconds of this chicken francese…as she showered it with praise. That brought me back here to start gathering more of your recipes. I found some Instant Pot recipes! Awesome! Again, thank you! Wow, this has always been a favorite dish of mine, but this recipe takes it up a few notches! I like the chicken ultra thin, as it cooks up so crispy and delicious! Topping it off with that heavenly sauce and all over linguine… simply yummy! It depends on how big the crowd it, but you can certainly double, or even triple, the recipe. It actually re-heats quite nicely, so you can make this several hours in advance of serving. Hope this helps! Curious – do you make the sauce ahead as well and reheat? Or leave the pan out and make the sauce as the cutlets are reheating? I never would have thought pre cooking would work for a recipe like this but it would be very helpful for feeding a large group. Thanks! This is so easy and delicious!! I pounded split breasts and salted with kosher salt a few hours beforehand to add flavor, then dried with paper towels before dredging in flour and egg. So much easier than breaded chicken cutlets! Thank you for sharing! Looks amazing, going to make it tonight! Thanks for a great recipe! This recipe looks amazing! Can I make it without breading the chicken? I’m on a low carb diet. Saw this just now, and am disappointed that I don’t have any chicken breasts. 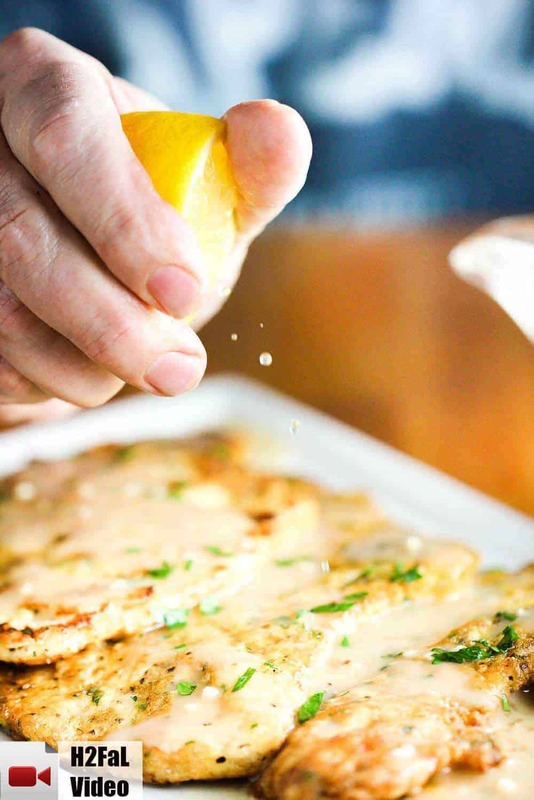 I’ll definitely be making this this week.we love piccata and know we’ll love this. Thanks so much. Another delicious meal. Made this for dinner tonight and my husband and I loved it. The sauce was delicious. Made recipe exactly as is perfection. I love your site. I love your recipes. The love you share with each other is evident in your food. So is your joy. This is by far my favorite food site! This is 5 stars but for some reason the fifth star won’t light. I’ve made this several times and each time I love it more. It is a perfect recipe and we just love it. I had used another recipe for over 25 years and it is not even close to how good your recipe is. Thanks! Can you make this and freeze it? We loved it, my husband is Italian and I made this at his request for Father’s Day, I was so nervous, but I followed the recipe to the letter and he said it was the best he’s ever tasted even in restaurants! I was so happy…..
Made this tonight – excellent – thank you so much! Am I doing something wrong with the sauce? It’s like watery and not much flavor. Just tastes like watery lemony butter or something and isn’t thick at all, even after adding cornstarch also. HI Sarah, so sorry the sauce didn’t turn out so great. It really depends how much fat/oil is in the skillet when you add the flour to create the roux. I would try adding 2 (maybe even 3 tablespoons of the flour)…it should really be close to the same amount of fat (oil/butte) that is in the pan. Stir that for a couple minutes to create a roux. That will eliminate any of the flour taste. And then proceed from there. This is definitely one of those recipes that I taste as I go, and adjust seasoning accordingly. I think with these adjustments and maybe adding a pinch more salt, you’ll get great results. I’ve updated the recipe to include these tips. Try it again. I literally just made this again two nights ago for The Loon and I, and it was crazy good. Let me know if this helps, and if you give it another go. Thanks much, Kris.